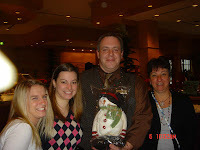 We had such a blast this past weekend in Harrisburg. 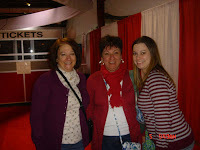 My sister Mair, my daughter Amy and my neice Kim and I all went to Harrisburg/ Hersey to go to an over 500 vendor craft show. You can not believe all the wonderful things you can get from snowmen to (this year) knives. The first night we were there, after driving for over 2 hours, we got to the hotel and check-in, put our bags away and went down to dinner. We were tired and hungry. We were asked if we were part of a group who had coupons to eat free and we said yes of course that we knew BOB or as we call him Uncle BOB. The waiter got a kick out of it and sat us in his section. He then told us his name was Simon and when we sat he said " Simon didn't say to sit" it was all we needed and we just joked with him the whole time. When Jared (aka Simon) came over he asked what we would like to drink and I made a jester with my hands for a large diet coke. When he came back with the order my drink was about 4 inches tall in the smallest cup I have seen. We still are laughing about it today. He was GREAT!! we asked for him every meal and had a blast. We got to the craft show and arrived at 9:00am and we got a great spot to park. We need a good spot so we can run out our treasures we buy during the day. Actually Amy and Kim run things out. We were able to get decorations for Amy's new house, as she will be married by next Christmas, Kim was able to buy for her apartment now that she lived in it for awhile. We also bought things for Stephanie's new house since she just moved this summer and doesn't have alot. Of course Mair and I buy for ourselves plus Christmas gifts. We were there for 5 to 6 hours shopping. We had a blast. We all can not wait for next year to come so we can do it all over again.